The postponement of Brazilian President Dilma Rousseff’s state visit to Washington was officially cast as the consequence of the lack of a good explanation for the National Security Agency’s cyber-espionage targeting her, the cabinet, Petrobras (the national oil company), and others. Although the Brazilian Foreign Ministry issued a letter stating that both countries agreed to the postponement, Dilma’s remarks at the UN General Assembly on September 25 about NSA’s activities were so harsh that it was clear that frustration with the Americans’ widespread spying on Brazilians remains extremely high in Brasilia. Experts agree that economically the postponement and bilateral tensions hurt the United States more than Brazil. Contracts worth billions of dollars between Boeing and the Brazilian air force (FAB) are at stake, as are agreements that would favor cooperation in oil exploration and development of biofuels and others that would facilitate the transfer of “sensitive technologies.” For Brazil, on the other hand, the postponement jeopardizes progress in talks to allow Brazilian citizens to enter the United States without visas – a project long-desired by Brazilians that was on the agenda for the state visit. Some observers in Brazil also speculate that, with the overall Brazilian economic slowdown, Dilma may actually prefer to have Brazilians spending their reais at home, not in the United States. In a tactical sense, Dilma may have feared that Edward Snowden will leak more damaging information during her visit to the U.S., causing her even greater embarrassment at home and abroad. In this way, fear and self-protection certainly played a role in her decision. On the other hand, the Brazilian president almost certainly saw domestic political advantages in a good old fight between the Brazilian David and the American Goliath. She is desperately in need of boosting her popularity after the demonstrations against corruption in the country. In fact, opinion polls show that public approval of her leadership increased from 45 to 54 percent just since the NSA dustup. In strategic terms, the postponement fits Brazil’s strategy for claiming its position as a global player – and expressing unhappiness when it feels frustrated. Dilma already had told President Obama in 2011 that Brazilians would seek a “more balanced relationship” with the United States. The postponement, like the speech at the UN, clearly reflects Brazilians’ desire to be treated better by the United States. 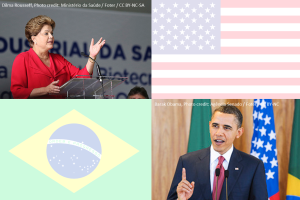 Obama’s speech at the General Assembly the same day, on the other hand, was interpreted by many Brazilians as emphasizing the United States’ traditional role as world policeman – not as the respectful neighbor in a new, multi-polar world order. In this battle of self-images, Brazil sees itself as one of the global leaders, while the United States sees itself as the mighty one, considering only the European powers as full equals. The broad base of Brazilians that Dilma is reaching out to is not “anti-American” in sentiment, and indeed wants a robust and respectful U.S.-Brazil relationship. That is in the interest of both countries, but for this shared objective to be achieved, Washington will need to recalibrate its responses to Brazilian concerns. Luciano Melo is a PhD candidate in the Department of Government at American University.